My question continues to be WHY do living organisms evolve as opposed to NOT evolving? The simple answer is because they can to which I ask WHY can they? There is no real reason why any organism MUST evolve, right? I guess this gets back to the old standby... "because God made it that way". 1. Everyone would have identical DNA and we would have a bunch of clones with identical DNA walking around. 2. Organisms would be unable to adapt to changes in the environment and would be wiped out by environmental changes. So mutations contribute to genetic diversity within a population and provide the ability for organisms to adapt to and survive changes in the environment. And this is where I "sit on the fence". It seems to me that there is no explanation as to HOW, much less WHY, we evolve at all. It seems that SOMETHING "designed" our cells in a way that they can take a random mutation and, somehow, decide that mutation is "beneficial" and then adapt/evolve with that mutation. I mean, there is no reason for evolution to happen, at all, but it does. Mutations happen and our cells are "programmed" to do "something" with it. Paul is correct in that it is clear evolution could not have occured without some guiding Superintelligence guiding it. However, with the common denominator of all species being the Creator and His guidance, there is no necessity, much less PROOF, that macroevolution happened at all - certainly not given it was HIS genectic coding and guidance that created the species. Go back and read up on the Big Bang's first few minutes, in which every physical building block, multiple dimensions, directionality, coordination, amazing designs of matter, quarks, antiquarks, etc., and unfathomably precise functionalities needed to form a universe capable of supporting life immediately roared into existence, whereas, minutes before, NOTHING physically existed. These things did not slowly evolve, but came about in mere minutes! And these things were much more unlikely occuring - least in comparison with some supposed billions of years of evolutionary history. That there are commonalities in genetics and designs should be unsurprising, given a common Creator! So, evolution isn't a given - nor was it a mechanism necessary to produce what exists. Just as evolution must FIRST have the first living cells which likewise could not have evolved. And so Christians need to look at the evidences without the bias of using their evolutionary glasses. Think of various miracles in Scripture - raising the dead, etc. - such things occurred as instant works of God - with no slow physical mechanisms or causes required. Progressive Creationism well fits the same evidences, without requiring evolution! The reason the single mutation path doesn't work is there are so many specific single mutations required to get from one beneficial state that natural selection will propagate to another beneficial state that natural selection will propagate. And the non-beneficial single mutations along the alleged path will not be propagated because natural selection has no reason to propagate non-beneficial single mutations. You seem to assume that there must be several mutations to go from one beneficial state to another. This is the key point in your (and Behe’s) argument and you repeat it constantly. You and Behe have given no argument for that proposition. Behe has tried to find examples that are aimed to show how difficult it is acquire some specific biological property or design, for example the eye and the flagellum. He has also given an everyday example, the mouse trap. All these, Behe says, are examples of irreducible complex designs that will not function if you take a way any part or subsystem. However, all these examples have been shown to fail. It’s easy to find discussions on internet. I haven’t seen any indication that the science of evolution has been influenced by Behe’s theory so it is of little interest. I have nothing to add regarding this question so I terminate this discussion now if you don’t come up with some other argument. 1.there are genes that control the behaviour of animals. 2. there are sometimes variations in the genes because of mutations. 4. these variation will sometimes influence the chance to get offspring. The result is that some mutations will increase the possibility for the bearer(s) of that mutation to survive and reproduce. That is, an evolution has occurred. 1 is a presumptions for evolution and is part of how life started. 2 seems to inevitable because of cosmic radiation for instance. There is no need whatsoever for any intelligent designer to intervene when 1. is in place and 1. isn’t a question about evolution, it’s about abiogenesis. Individual cells or organisms aren't supposed to evolve or adapt though, are they? It's populations that are said to evolve. An individual doesn't need to do anything with a mutation; the mutation just might happen to be beneficial for it and increase its likelihood of reproduction. Anyway, as you describe yourself as a theistic evolutionist, what do you think about evolution? Nils presumes there are other methods, not because science has proven or observed them, but because in his mind, they MUST exist! How to comment such nonsense? But not only would they need to exist, but successful mutations must have a certain level of numbers AND they must be rapid enough. And so without data to even show other mechanisms or methods existed, try explaining the rate of mutations and the changes necessary to explain the fossil record of the Cambrian, which happened in a stunningly short period of time. So, what hit the fast-forward switch on THAT???!!! Unguided evolution simply could not have had nearly the necessary time to produce the stunning array of new forms and the complex predator/prey relationships of the Cambrian! Why not read for instance on Wikipedia about the current scientific view on the Cambrian evolution. There you can find information why evolution perhaps was faster during that period. Nils, I stated that because you've argued relentlessly for some Godless explanations for what is possible, yet without producing any examinable proof for what you insist is. You use the jargon of science-speak and speculation, yet without providing anything credible to support it. And so that tells me you believe what you do based upon something besides science or provable facts - that you believe it per emotion-driven desire per what you don't want to consider to be possible. Of course, you're still arguing about WAY secondary processes that would have taken place billions of years beyond what you really need to explain (The Big Bang event). Evolution has not one thing to assert that dismisses God necessary to the universe's existence, composition, designs, functionalities, and comprehensive coordination between processes and components - which is why the debate is even important to most here. And it begs the question as to what you think blind, non-intelligent things are capable of producing. Not to mention NOTHING can create itself! And the moment before the Big Bang, NOTHING physical even existed. And mere minutes later, multiple dimensions and extraordinary things of incredible designs interacted with stupendous precision in astonishingly coordinated orchestration. These are what you REALLY need to explain - the PRIMARY catalyst for the universe, and not secondary processes, billions of years later, that no one can provide a satisfactory explanation for - which is a far different matter than providing mere speculations - and even though that is actually the much easier aspect of what needs to be explained, in comparison to the astonishing Big Bang event. Again, what can blind, non-intelligent things do or cause - and please begin with how they even exist to begin with! Then contrast arguments asserting a necessary billions of years of evolution vs. the very first SECOND of the Big Bang, and look at what was produced within that literal blink of an eye! 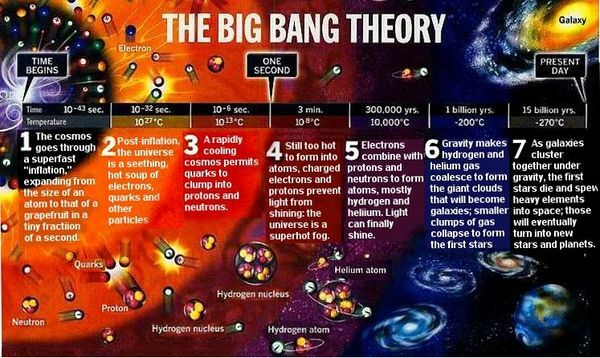 And so look at what happened in ONE SECOND after the Big Bang began! And it is the polar opposite of randomness and chaos, and also one revealing some vast Intelligence required to instantly organize and create such things of immediate intricate sophistication, designs, functions and interactivity of just the right things required to build our universe. This event, in one mere second, checks ever possible box for what would require incredible intelligence, as our best scientists have spent 100 years trying to understand its components and how it worked. But as to WHY or HOW this would be possible - the answer isn't to be found via scientific analysis. But what can be certain is it required unbelievable power, intelligence, and something that is eternal / could not create itself and stood outside its creation. I have followed the internet back and forth between Behe and his detractors. And you are just factually wrong on this assertion. Behe's poster child of irreducible complexity (the flagellum) has not been shown to fail, despite a number of discredited attempts to do so. Yes, the large number of irreducibly complex biological systems in the world today is a fatal flaw in your unproven presumptions. But the complexity of DNA at the molecular level is yet another stake in the heart (nice Halloween metaphor) to your unproven assertions. All you have to do is examine the scope of differences in the DNA at the molecular level between different life forms. One of two things has to be true to support your act of faith. 1. Multiple simultaneous mutations at the molecular level would have to occur to bridge the scope of the DNA gap. And observed random mutations tell us that could not happen within the timespan of the existence of life on earth. 2. A path of single mutations at the molecular level would need to be followed to bridge the DNA gap. But this presumes that natural selection would have to propagate a number of non beneficial single mutations before they combine to form a beneficial state. And this goes against the fundamental behavior of natural selection to propagate beneficial mutations. Both of these presumptions are directly contradicted by the observed behavior of random mutation and natural selection. I have nothing to add regarding this question so I terminate this discussion now if you don’t come up with some other argument. No other argument is needed. Since you have failed to address the problems that your unproven premises have with the observed behavior of random mutation and natural selection. DB: No other argument is needed. Since you have failed to address the problems that your unproven premises have with the observed behavior of random mutation and natural selection. And so it would seem that Nils is "out of bullets." As his premise has insurmountable problems. So the question then becomes, so, why does he believe it? And can anything come from nothing? As some "thing" HAD to be eternal to produce what exists. And that "thing" was necessarily already intelligent, as non-intelligent things, by themselves, cannot a) create themselves, nor can they b) develop intelligence or learn, as c) they lack the attributes and capabilities to do so - as they are "dead" non-sensing, non-intelligent things. But people talk of such non-intelligent things and processes as if they have the capabilities of a thinking, living creature that has intelligence that is beyond our comprehension. But why would they ever believe THAT? It show clearly that there isn’t only one possible way to evolve to the flagellum. It can’t be proved that stepwise evolution doesn’t work. Now you are a bit clearer. But from where do you get that there is a “DNA gap”. You assume that there has to be many non beneficial mutations to form a beneficial state. This seems to be confused. A beneficial mutation is a mutation that is beneficial to the individual. If that mutation is spread in the population we have a new “state”. One single beneficial mutation is enough. Here's what I mean by "DNA Gap". "About 35 million DNA base pairs differ between the shared portions of the two genomes, each of which, like most mammalian genomes, contains about 3 billion base pairs. In addition, there are another 5 million sites that differ because of an insertion or deletion in one of the lineages." So the "DNA Gap" between humans and our closest 'living relative' involves over 35 million DNA base pairs. Now mutations occur at the base pair level of DNA. Observed mutations in malaria have demonstrated that 3 coordinated random mutations goes beyond the capability of all life that has ever existed on the planet. If 3 coordinated mutations is an insurmountable gap, then the 'DNA gap" of 35 million base pairs between humans and our closest 'living relative' is prohibitively improbable as is a hypothetical unproven path of 35 million single beneficial mutations that would need to be be propagated by natural selection from a hypothetical common ancestor. And that's our closest 'living relative'. 2). there are scientific explanations that you are ignorant of (for instance copying of chunks of base pairs and sexual reproduction). You apparently prefer 1). I don’t. Why not read some elementary texts on evolution that isn’t produced by Discovery Institute. And so it would seem that Nils is "out of bullets." As his premise has insurmountable problems. So the question then becomes, so, why does he believe it? It’s wise to believe in science. And can anything come from nothing? As some "thing" HAD to be eternal to produce what exists. And that "thing" was necessarily already intelligent, as non-intelligent things, by themselves, cannot a) create themselves, nor can they b) develop intelligence or learn, as c) they lack the attributes and capabilities to do so - as they are "dead" non-sensing, non-intelligent things. But people talk of such non-intelligent things and processes as if they have the capabilities of a thinking, living creature that has intelligence that is beyond our comprehension. But why would they ever believe THAT? - It is common in science and engineering to use evolutionary algorithms and procedures that produce new information, creating something out of nothing. - Why was there a “thing” that “was necessarily already intelligent”? The problem with your assertion is that the types of observed mutations that most frequently survive natural selection are deletions. Copying base pairs are not the most frequent type of mutation nor are they the most survivable type of mutation. So copying base pairs and sexual reproduction still isn't enough to bridge the DNA gap in the fossil record and the DNA in life today. And that's ok. The ongoing search for knowledge is a good thing. But let's not perpetuate the false narrative that science has demonstrated that random mutation and natural selection alone are adequate processes to explain life on earth. That Darwinistic presumption is a 'statement of faith' as opposed to a conclusion that is grounded in empirical observation. DB: But let's not perpetuate the false narrative that science has demonstrated that random mutation and natural selection alone are adequate processes to explain life on earth. Which is why I said Nils' belief is an emotional one - as it is mere theory and speculation that's not even remotely confirmed by actual scientific evidence. So people shouldn't pretend it has been!